I don’t know what you were doing when you were 24 but I know I wasn’t writing business plans and getting funding to start an Internet company that would go on to make millions of dollars. That’s what Jessica DiLullo Herrin did in her twenties and again in her 30s. She was a so-so high school student who went off to community college. For many people that’s it, but Jessica transferred to Stanford got her degree then dropped out of business school to start her own company. Now, she’s the entrepreneur behind the multimillion-dollar Stella & Dot franchise. 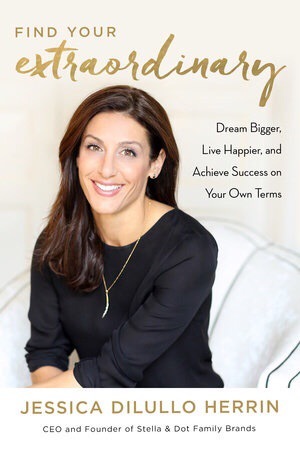 And her book Find Your Extraordinary is a mixed bag of her experiences, lessons she learned along the way and advice for anyone who wants to live out their dreams too. It starts slowly. The first chapter of the book is 19 pages long – 19 pages where Jessica Herrin introduces herself and tells you what the book is not going to be about. That’s a long disclaimer and if you’re not careful, you might start thinking this isn’t a great book at all – maybe it doesn’t have all the things I am sure I need to succeed. My advice? Stick with it. If you’re tempted to skip past the first chapter, go ahead and do it. Because if you start on page 20, I guarantee you’ll be hooked from the first paragraph. See that you have more choices besides using brute force to climb over your obstacles – if you ask for it, and if you’re the kind of person who will return a favor, you’ll find people to give you a boost. And sometimes, if you look carefully, there is a door and you can just open it and walk through – which is an epiphany she has after meeting someone she thought was a mentor but who was actually too jaded from experience and discouraged by the hard work he knew was ahead to even attempt something new. If you believe there is only one way to get to where you want to go in life, you will never arrive. which is her response to being accepted to Stanford. But Herrin believes she would be a success regardless of where she went to school and with that attitude, I am inclined to believe her. If you walk eagerly down the road of life with your eyes wide open to the opportunities around you, eventually you will bump right into your passion. The journey to extraordinary starts there – which she says about finding the inspiration to start not one or two but several successful enterprises. If you’re merely interested in something rather than passionate about it, it isn’t worth your time – which she uses as a caution against wasting time and effort. There is a great visualization exercise that made this lesson in particular resonate with me.Find your Extraordinary is in the Business category because Herrin is a businesswoman but the lessons in the book are not about finding success in business; they are about finding success in life – being the happiest you can be because you’ve fulfilled your passions. Find your Extraordinary is a wonderful story about coming back from behind and winning. Jessica Herrin is a young woman who made her dreams come true so she’s an inspiration to anyone who also wants to pursue a big dream. I think it is worth it to see her speak live and I am looking forward to seeing her on tour. Nice post Karen – I like the thinking of this lady. Thanks Simon. Me too. Her story resonated with me because I went to community college too but I went on to get a Bachelors and a masters degree. I feel like I am destined for success. A slow start is just part of the story, right? Absolutely, we’re often told it’s not the destination that counts but the journey. Thanks Simon. Interesting statement which I’ve said myself although I am now inclined to believe that they both count – the destination counts too. Otherwise, we are just meandering on an aimless journey. With no goal in sight, how do you know whether the journey was profitable? This is true, but sometimes people fixate on their view if the destination and don’t let it change with circumstances. As it’s good to talk to you for the same reason. She sounds like a very inspiring women – that kind of determination is rare. Yes she is! It’s so much easier to settle than it is to strive for something better. I love her story and I’m trying to live an extraordinary one myself.